Northern Territory During the Wet Season – Well Worth It!! We recently returned from a trip around the Northern Territory and I thought I would share my story as we were there at the end of the wet season, but still had the most incredible time. We arrived in Darwin at the end of April and it was just our luck that the Northern Territory had experienced one of their wettest wet seasons, so many of the roads were still closed. We had originally planned to do a day trip to Arnhemland but unfortunately Arnhemland was still cut off so we had to forget about that idea. Anyway, we hired a car and set off from Darwin late one Saturday morning and made a quick stop at Parap market as we drove out of the city. We decided to stop there and get some lunch from one of the many food stalls at the market. If you manage to get to Parap markets, I recommend trying the Paw Paw Salad (with or without chillies) if you want to try something a little different, made with green paw paw and a number of other yummy ingredients. We then drove into Kakadu National Park and stayed the first night at Aurora Kakadu. The next day we had pre-arranged to go on a scenic flight over Kakadu. It was beautiful seeing the land from the air, which was very green after all the rain. We flew over the famous Jim Jim falls and Twin falls, which looked incredible from the air. We then did the Nourlangie art site walk, where we got to see some ancient Aboriginal rock art, which we really, really enjoyed. Highly recommended. We spent that night at Gagudju Cooinda Lodge on the Yellow Waters Billabong so that we could do the Yellow Waters boat cruise the next day. We did the early morning cruise at 6.30am which we were told was the best time to do it, which was true (Note - don't forget the mosquito repellent!). We got to see lots of birdlife and 3 very big saltwater crocodiles ... 2 of which were stalking a small tinnie where a group of fishermen were fishing for barramundi ... very brave men! After the cruise we then started the drive to Katherine and got to experience what it's like to drive behind the famous "road trains" ... and try and overtake them, which was pretty scary! In Katherine, we decided to stay at the campground at Nitmiluk, next to the gorge. We spent 2 nights there, one of those nights we stayed in a Safari Tent, which was an interesting experience due to the fact that a group of bats had decided to spend the night in the nearby trees. I didn't know bats could be soooo noisy - but it was all part of the fun I suppose!! There were also quite a few wallabies roaming around the campground too. The next morning we did a cruise through 2 of the gorges at Katherine Gorge. We would have liked to have hired a canoe, but unfortunately, the canoes were still not open for hire due to the time of year. However, we still really enjoyed the cruise and experiencing the gorge. The highlight of our trip, though, was the next day when we did a walk through the Nitmiluk national park to the Southern Rockpool. We were told that we would be able to swim there – one of the few places where you can swim in the wet season as there are no crocs at the Southern Rockpool. So we set off with comfortable walking shoes and plenty of water. The walk itself was more like a trek than a walk, sometimes having to scramble over large boulders, so we were glad we had good walking shoes on. But the trek was definitely worth it. 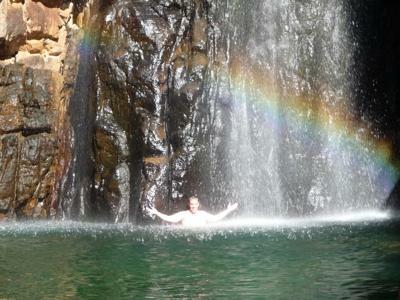 The rockpool was spectacular, with crystal clear water, a waterfall and it's very own rainbow! It was just us and another group of 3 people at the waterhole, probably because it was later in the day - we got there at about 3.30pm. We spent about half an hour there swimming and enjoying the rockpool and then started the trek back. All in all, it probably took around 4 hours round trip. Next day we set off on the long drive to Litchfield. The main falls of Wangi falls and Florence falls were closed for swimming due to currents and crocs, but they were a wonderful site due to the sheer volume of water ... in fact you could hardly stand in the viewing platform because of the water spray from the waterfalls. The highlight though was another great spot with no crocs where we could swim and cool down called Buley Rocks. So, as you can see, we had a fabulous time in the Northern Territory, even in the wet season. I will be back, though, to visit Arnhemland and also of course to visit the Kimberley! Tip – There is not a huge selection of accommodation or places to eat in Kakadu or Litchfield, and we found sleeping and eating quite expensive - in hindsight I think it would have been cheaper to hire a campervan where we could have slept and cooked. If you do want to stay in a hotel room, rather than a tent or camp, make sure you book in advance, especially during the dry busy season. We found that some accommodation was fully booked even in the wet season. Comments for Northern Territory During the Wet Season – Well Worth It!! Good to hear you liked this wild, wet time of the year. Haha, yep, the fishermen are brave and the bats noisy, no doubt about that :-). I hope you'll soon get a chance to see some of our more out of the way places! It sounds like you guys had a blast. 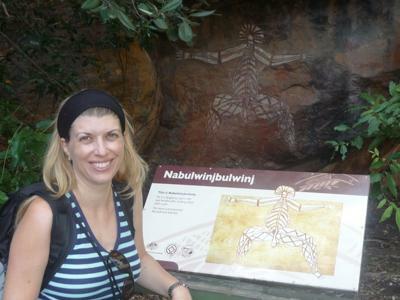 I returned a month ago from with my family from traveling around the Northern Territory and we enjoyed ourselves as well. The landscape was just spectacular. We did not get to do a science flight around Kakadu, but I wish we had, I kind of regret not getting to do that. I agree with your tip about hiring a camper-van since you do not have a lot to choose from in the way of restaurants and hotels. We hired a camper-van and had a great time cooking our own food. The one great thing we did different from your trip was taking Litchfield 1 Day Tour & Private Crocodile Cruise from . It was great, we got to ride past the crocodiles on a boat and see them up close. We got to stop and take dips into the swimming holes in Litchfield National Park; it was both beautiful and refreshing. Great to share your personal experience Susana! I really can feel your graze here. Thanks so much. We were worried about travelling through the NT in the wet season, but your comments were a great help. My partner and I went to the Northern Territory in November 2013 just before the beginning of the wet season. We are in our early 50's and decided to do a tour so we could see a bit of everything the Territory has to offer. We started in Darwin, then on to Kakadu,Litchfield, then a night on the Ghan getting off at Alice Springs and on to Uluru for two days. I have been to the U.S. which I enjoyed but my trip to the Territory was one of the highlights of my life up there with the birth of my children. I never realized how beautiful my country is until that first time I saw Uluru. No picture, no film or someone's description can really describe how beautiful and powerful it is. In fact, I cried. I'm still not sure why but that was the effect on me. It gave me goosebumps. Anyone coming to holiday in Australia, please visit the Territory, you will NOT be sorry, only so glad you did and the Territory should be on every Australian's bucket list!!! Whether it's the wet season or not!!! !